‘Like’ Lushington Entertainments on Facebook and follow us on Twitter to get the latest news on all our events! Go to the Official ROXETTE Live in Singapore Facebook Event page to RSVP and invite your friends to the concert. Which Swedish band was more successful in America than ABBA? Yes, the Swedish band that had more number ones and Top 10 hits than ABBA in the US (and once featured on their very own postage stamp) are coming back to Singapore in 2012. Marie Fredriksson and Per Gessle who make up Roxette, came out of Sweden in the late ’80s. Their game was pop and their mission was to conquer the world. With 33 chart-busting singles and total record sales of 75 million, it seems safe to say “mission accomplished”. Except for one thing – it ain’t over yet! Biding their time during Marie Fredriksson’s recovery from her brain tumour in 2002, the band has gradually staged a comeback that has climaxed with the release of their new album Charm School and their current world tour. After an extremely successful start in Russia, Roxette went on to sell out concerts throughout Europe, South America and South Africa over the last year with more than one million tickets sold at 70 concerts. After such an overwhelming response in the rest of the world, Roxette have decided to extend the tour to include a very special show in Singapore. Roxette’s brand new album Charm School was released by EMI earlier this year. Charm School went straight to number one on the German, Czech and Swiss album charts the week of its release and is heading for platinum status in Sweden. With a catalogue of mega hits including It Must Have Been Love, Joyride, Listen To Your Heart, How Do You Do, Sleeping In My Car, Dressed For Success and The Look, this is set to be one of THE live events of the 2012 calendar. Roxette last toured Singapore in 1995 on their Crash! Boom! Bang! world tour. A year when we still didn’t quite know what a “Spice Girl” was or what the World Wide Web was all about. And Facebook!? What was that? So grab all your friends, listen to your heart and get yourself dressed for success and get ready to join the joyride with Roxette in 2012! Internet Sales Channel – 14 Dec 2011, 9am. Other Sales Channel – 14 Dec 2011, 10am. CHUGG & LUSHINGTON in association with COURTS are ecstatic to announce that six-time Grammy award-winning rockers and 2011 MTV VMA Best Rock Video winners the FOO FIGHTERS will be performing One Night Only and One Show Only in Asia to be staged at the Padang in Singapore on Friday 2 March 2012. They are lauded by most as the “last popular gasp of respected rock” and are currently nominated for six Grammy’s at the 54th annual awards ceremony to be held on 12 February in Los Angeles. Over the course of their 16 year history career, FOO FIGHTERS have sold millions of records and raised countless voices in sing-alongs of iconic anthems like “Everlong” “My Hero” “Learn to Fly” “All My Life” “Best of You,” and “The Pretender”–with new favorites such as “Rope” and “Walk” from their current international #1 album WASTING LIGHT now generating equal enthusiasm. FOO FIGHTERS’ constantly evolving blend of unrestrained hard rock fury and irresistible pop melody has been often imitated yet never equalled, winning over more fans and critics with each passing year. 2011 has seen the band receive the most positive critical notices of their career with Rolling Stone calling Wasting Light “the best Foos album since the first two.” Meanwhile recent highlights of their increasingly ambitious touring agenda include last July’s extraordinary 130,000 capacity weekender at Milton Keynes Bowl in the UK and last month’s Australia/New Zealand stadium tour–whose finale’ generated actual geological tremors. Each and every FOO FIGHTERS show is truly a resounding testament to their longevity and to ever-growing fan base which is now well into its second generation. Demand has never been higher for a stadium rock quality rock extravaganza. FOO FIGHTERS are more than happy to oblige with the biggest rock concert of the year in every city they visit the world over. Chugg & Lushington are both powerhouses in their own right and yet we are excited to have this opportunity of jointly combining forces to ensure that what the FOOS have created is staged at a magnitude that will do justice to the Band, the punters and be one for the history books. Memories will abound and be indelible as Singapore welcomes the FOO FIGHTERS for a magnificent night of unadulterated rock. Internet Sales Channel – 13 Jan 2012, 9am. Other Sales Channel – 13 Jan 2012, 10am. 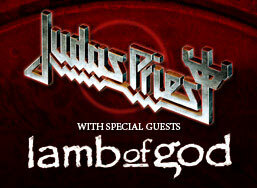 JUDAS PRIEST ”The Epitaph Tour” with Special Guest LAMB OF GOD Live in Singapore! ‘Like’ LAMC Productions on Facebook, follow us on Twitter and add us on Google+ for breaking concert news! RSVP and invite friends to the Official Judas Priest & Lamb of God Singapore Facebook Event page. After storming the world for nearly 40 years and taking their very special brand of heavy metal to all four corners of the planet, JUDAS PRIEST – one of the most influential heavy metal bands of all time, have announced their first ever Singapore tour date on February 20, 2012. This is the only show in South-east Asia on the EPITAPH Farewell World Tour. The mighty PRIEST will certainly be going out strong as they rock Singapore on the massive EPITAPH tour. They will be playing the songs that helped make the name JUDAS PRIEST synonymous with heavy metal! Joining JUDAS PRIEST on this colossal heavy metal double bill as special guests is “Pure American Metal” titans LAMB OF GOD. The leaders of modern heavy metal make their highly anticipated return to Singapore in conjunction with the release of their new album “Resolution” in January 2012. So start getting prepared to rock with JUDAS PRIEST and LAMB OF GOD on February 20, 2012 at Fort Canning Park!! Internet Sales Channel – 28 Nov 2011, 10am. Other Sales Channel – 28 Nov 2011, 10am. Lushington Entertainments proudly announces EVANESCENCE LIVE at Singapore Indoor Stadium on February 27, 2012. After a three year sabbatical, the multi-platinum, worldwide success of their sophomore album, The Open Door, Grammy award winning band Evanescence have released their third self-titled studio album produced by Nick Raskulinecz (Foo Fighters, RUSH, Deftones). Evanescence is Amy Lee (vocals, piano), Terry Balsamo (guitar) Tim McCord (bass) , Will Hunt (drums) and Troy McLawhorn (guitar). Led by Lee’s operatic, passionate vocals, Evanescence has sold close to 25 million albums since its 2003 debut, Fallen. The project’s premiere single, Bring Me To Life snagged the band a Grammy for best hard rock performance. Other massive hits followed, including My Immortal, Going Under, and Call Me When You’re Sober, establishing Evanescence as worldwide tour headliners. The inherent drama in Evanescence’s music – a kind of audio odyssey that can turn on a dime from piano-led introspection to hammering guitar – has resonated with listeners everywhere. The music’s core, which ranges from beautiful to subtle to aggressive, finds a counterpart in Lee’s passionate vocals, lyrics that forge a connection with audiences searching for identity or struggling with feelings of desire, hope love and loss. Now, Evanescence’s thoughts have turned to returning to the road. “This record is so geared for live shows,” Lee says. “We were thinking about playing live the whole time we were writing it.” Making the return all the sweeter are the fans. “I can’t describe how great it feels to have their support. I love so much meeting them before and after the show. If feels like they’re growing with us” says Lee. 4 Jan 2012, 10am – 5 Jan 2012, 10am. O’lando Music Production Pte Ltd, proudly presents SLAM’s “Kembali Merindu” Concert 2012 live in Singapore. With band members comprises of Ajaq, Eddie, Lili, Man, Shah and Zamani, SLAM was formed in the early 1990s, and is today considered one of the most unique and respected bands in the Malaysia, Brunei, Singapore and Indonesia music scene. With their soothing and romantic Rock Ballad list of songs from their many albums, they never fail to entertain and mesmerise the fans. In their upcoming concert, SLAM’s have been thoroughly involved with its conceptualization, participating in the song selections, stage directing and live performance directions for the show. Expect to see a specially created impressive stage setup from an Experience Producer. SLAM themselves will be involved in the storyboard, as they expect nothing less than a perfect performance for their fans. There will also be a Special Appearance and music collaboration from our local talented music group of three young men, “OrkestarTrio”. SLAM’s singer, Zamani, is known for his powerful and unqiue vocals, capable of spellbinding the audience in live performances, with their evergreen hits song like Gerimis Mengundang, Kembali Merindu, Nur Kasih, Maria Mariana, Kembali terjalin and more. Be prepared to rock the night away with SLAM, as they bring their mega concert to Singapore for the first time at the Suntec City Convention Hall on 24th February 2012.